Alpha Delphini won last season's Nunthorpe Stakes under Graham Lee. BRYAN Smart’s dramatic Nunthorpe winner Alpha Delphini will make his seasonal reappearance in next month’s Temple Stakes at Haydock. The Hambleton trainer has been setting out plans for his stable star who came of age when landing the Nunthorpe Stakes at York’s Ebor festival last year in the most dramatic of circumstances. 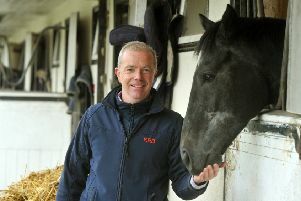 Ridden by former Grand National-winning jockey Graham Lee, Alpha Delphini beat the Michael Dods-trained Mabs Cross in a photo-finish – it took several minutes before the result was confirmed – with the runner-up going on to win the Prix de l’Abbaye, France’s premier sprint, at ParisLongchamp when Smart’s sprinter did not show his best form. 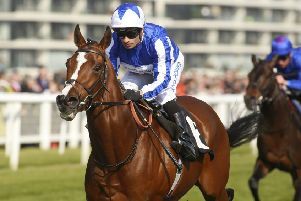 Both Northern-trained horses are set to continue to resume their rivalry this summer, with Smart opting for the Haydock race ahead of the Palace House Stakes at Newmarket’s Guineas meeting next month. “We’ll wait for the Temple to start him off,” said the trainer. “I personally don’t think he handles Newmarket that well, and he’d have had a big penalty anyway, so you’ll see him in the Temple.